The second day arrived to find toast being cooked to order on B3 – there are still a few tweaks to be made, but the patients were really pleased to have warm toast that wasn’t waiting to be served, at the risk of going cold and soggy. 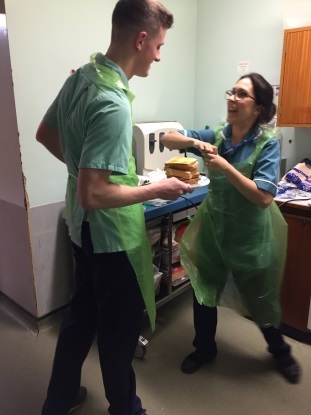 Dining companions have been busy on many wards, and are reporting back how useful and enjoyable it has been. 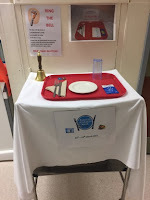 Again, we have seen many useful and innovative ideas to increase awareness of nutrition and hydration; these range from highlighting the use of red trays to healthy snack swaps for staff. The enthusiasm we have seen is really inspiring, taking on the true spirit of the week – the MDT approach is amazing. Our food bank collections is up and running so please bring as many items as you can. We are collecting for the Trussell Trust who run a network of over 400 foodbanks, giving emergency food and support to people in crisis across the UK, where thirteen million people live below the poverty line. In the last year they gave 1,109,309 three day emergency food supplies to people in crisis. We have been very busy Tweeting our successes and have had a great response from the Nutrition & Hydration team, making NUH a leading force in nutrition. 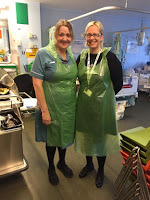 Tomorrow is the Global Afternoon tea party, we are really grateful to the wards who have been preparing for this, and have just taken delivery of lots of cake slices – can’t wait!